For motivated students, a blended master of science program, also referred to as a 5 + 1 program, is available. The blended program allows students to simultaneously complete both a BARCH and an MSARCH. The blended program offers promising individuals an opportunity to continue their studies in architecture in a collaborative multi-disciplinary learning environment. (catalog.calpoly.edu/graduateeducation/#generalpoliciesgoverninggraduatestudiestext), in addition to the requirements outlined by the Architecture Department MSARCH Program. Students wishing to pursue the blended BARCH + MSARCH degree shall complete the Blended BARCH + MSARCH application (click on link blow). 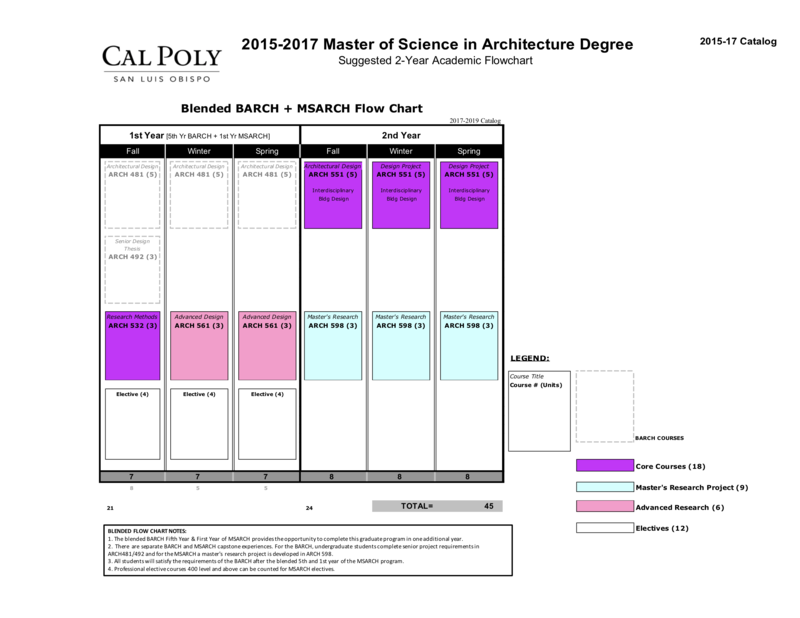 Applicants may contact the MSARCH coordinator, msarch@calpoly.edu, after their third year of the BARCH program for further information. Submittal of Blended BARCH + MSARCH Applications is closed at this time. The blended BARCH Fifth Year & the First Year of MSARCH provides the opportunity to complete this graduate program in one additional year. There are separate BARCH and MSARCH capstone experiences. For the BARCH, undergraduate students complete senior project requirements in ARCH481/492 and for the MSARCH a master’s research project is developed in ARCH 598. All students will satisfy the requirements of the BARCH after the blended 5th and 1st year of the MSARCH program. Professional elective courses 400 level and above can be counted for MSARCH electives.